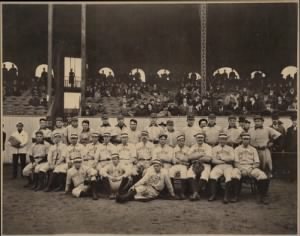 On October 1, 1903, the Boston Americans faced off against the Pittsburgh Pirates in Game 1 of the first baseball World Series; the series lasted until October 13, when the Americans emerged the victors of the championship. Although the National League was well established by 1903, the American League was still new. American League president Ban Johnson decided to give his league a boost by lowering ticket prices and promising fans clean baseball—and by raiding players from the National League. Finally, the National League had had enough, and in January 1903, the two leagues met in Cincinnati for peace negotiations. The agreement resulted in the end of player raids and allowed for the existence of two equal leagues. With the two leagues now at peace, the owner of the Pittsburgh Pirates (the National League 1903 pennant winners) proposed a best-of-9 championship series to the owner of the Boston Americans (the American League pennant winners). An agreement was signed in mid-September, with the first game of the series slated to begin just a few weeks later, on October 1. Going into the series, Pittsburgh was generally favored to win—however, key players (including one of the pitchers and Honus Wagner, legendary shortstop and batter) had suffered injuries, and another pitcher had experienced a mental breakdown. This left essentially one strong pitcher for the Pirates—Deacon Phillipe, who would go on to pitch five complete games during the series. The Boston team, meanwhile, boasted star pitchers Cy Young and Bill Dinneen. Game 1 was played in Boston to a crowd of more than 16,000, who more than filled the park’s 11,500 seats. The Pirates won the first game, but Game 2 went to the Americans. Game 3 went the Pirates, as did Game 4, which was the first of the Pittsburgh-based games. Heading into Game 5, the Pirates were ahead 3 games to 1, but then the Americans won the next two games, tying the teams at 3 games apiece. The Americans’ victory in Game 7 put them ahead, and their victory in Game 8 (played back in Boston) made them the first World Series champions. The 1903 championship series between the American League and the National League began a tradition that has lasted more than a century. In 113 years, there have been only two years without a World Series: 1904 and 1994. Do you have any World Series memories? Tell us about them! Or find more articles about the 1903 World Series on Newspapers.com.